Who will win the big prize? And more importantly, who will be the best dressed? I could write a whole article on why Brie Larson will be taking home a little golden man for her role in Room or lament the impending death of "Leo doesn't have an Oscar" jokes (as much as I hate to say it, dude's probably going to finally win an Oscar for The Revenant) but come on, do you really think the awards are the most important part of the Oscars? Here at the Fashion Barbie, it's all about the red carpet, so in preparation for an exciting weekend of couture and custom gowns worn by the leading ladies of Hollywood, I'm sharing my predictions (and hopeless wishes) for what the nominees will be wearing. Keep reading to see my picks! Alicia Vikander is a stunning actress and total fashionista. Ever since Ex Machina's press tour she's been wowing the public with her Louis Vuitton looks and restrained glamour. 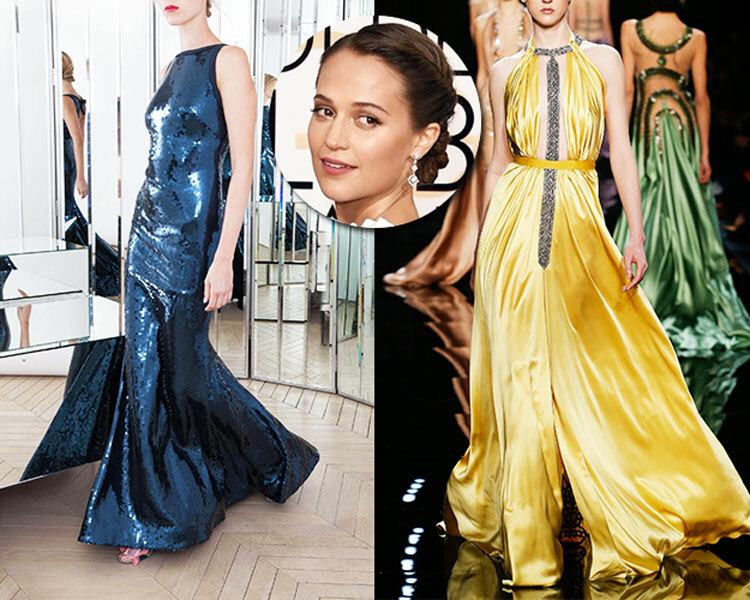 I would love to see Vikander embrace the spotlight with a shimmering sequin Alexis Mabille gown in oceanic blue or a Grecian yellow silk dress. Each one has just the right amount of bling to make a statement, but not be overpowering. Plus, Vikander is one of the few people on the planet who could pull off that color yellow. Brie Larson is almost guaranteed to win an Oscar on Sunday, so girl's gotta bring her A-game. Luckily, Larson is another up-and-coming style star, so securing a gorgeous gown won't be an issue. 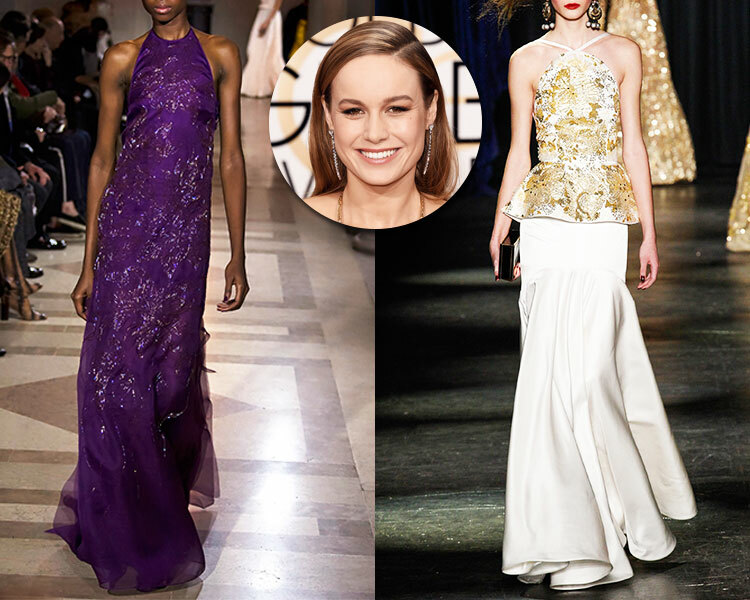 If I were her, I'd have my eye on the gorgeous royal purple Carolina Herrera dress for a modern look, but the white and gold Naeem Khan gown will look stunning as well. I just love the Carolina Herrera dress since it's simple and laid-back in shape, but absolutely breathtaking in details. No matter what, Larson is going to look radiant! Queen Kate can do no style wrong, so why not go for it with the crazy tattoo-embroidery dress from Sarah Burton's Alexander McQueen? Seriously, she would look like a badass Renaissance royal/witch, and I would be all about it. Sure, the masses may not ~understand~ it, but Cate is on a whole other level and the fashion crowd would totally fawn over it. But, if Cate has to wear a more universally-appealing dress, Alexis Mabille has just the thing: a simple blue gown with a trailing train and lace back. It's the kind of sophistication that Blanchett exudes, and I'd be just as happy to see her in a lovely dress like this on the red carpet. As the oldest nominee among the women this year, Charlotte Rampling is bringing her years of style experience to Hollywood's biggest night. I think an elegant cream Carolina Herrera gown or deep red Jenny Packham dress would look lovely on her. Pair with statement earrings and you've got yourself a classic look. To be honest, I don't know that much about Jennifer Jason Leigh's red carpet style, but if her most recent appearances are any indication, I think she could really pull off the one-shoulder Andrew Gn dress with sweet floral detailing or this fun black and white Derek Lam dress. Oh, J Law, what will we do with you? While I enjoyed what the design house had to offer for Dior Spring 2016 Couture, I was left wanting when it came to their eveningwear selection. As you all probably know, Lawrence is still in contract with Dior, which means there is a 95% of her wearing the designer on Sunday. Granted, she'll probably don a custom creation, but if I had to pick, I'd love to see an altered version (think, a more dramatic skirt) of the sky blue dress on the right. If Lawrence were to go with another designer, however, I think she could do wonders with this rich velvet Ralph Lauren dress. It's simple columnar shape works with Lawrence's figure, but it's the deep purple hue that will really take people's breathes away. 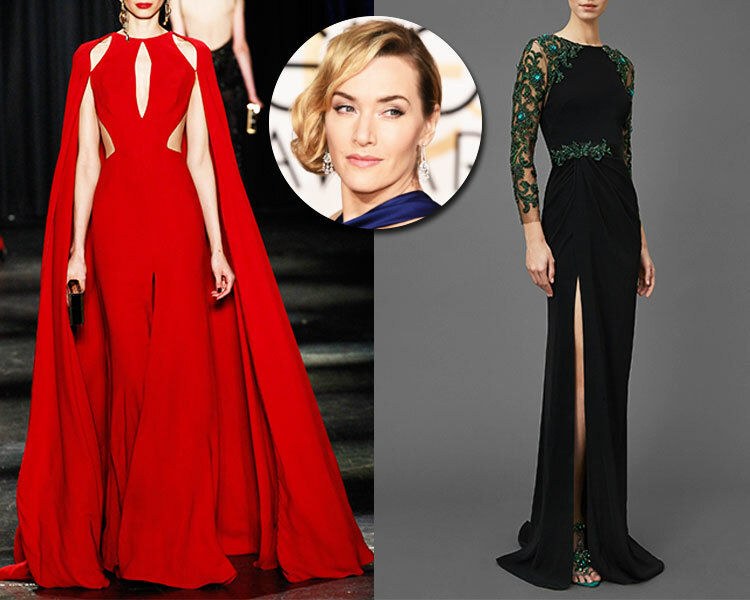 Kate Winslet tends to play it safe on the red carpet, so I would love to see her don a dramatic red a la this caped Naeem Khan dress. She would look totally breathtaking in that gorgeous color, and Kate in a cape? Yes, please. But if she opts for a less flashy look, this Marchesa dress with emerald beaded sleeves is a good compromise. 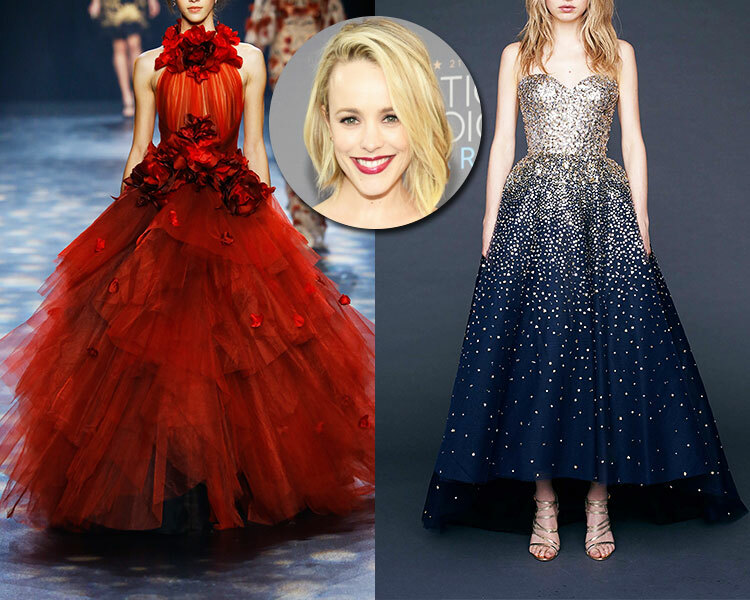 I can always count on Rachel McAdams for some much-needed princess gown action. When this brilliant red ruffled gown made its debut on the Marchesa runway a few weeks back, everyone was begging for it to make a red carpet appearance. McAdams could be the one to pull it off. I also like this gold and navy dress that looks like a radiant night sky. Either dress would make me happy! Does Rooney Mara ever smile? That was the question I asked when trying to find a picture of her to use for this, and according to my vast research (10 minutes of browsing Google Images) the answer is no. But that's besides the point. Regardless of her facial expression, Mara knows how to rock a fairy princess dress and give it a punk rock edge, so I'd love to see her in this ethereal lavender dress from Marchesa. For a more vampy approach, this cool Roksanda dress could fit nicely, too, and would flatter Mara's lithe frame. Also, because Mara has such a distinct style, I could also see her wearing any of the Rodarte gowns from the Fall 2016 collection or any of Gucci's kooky dresses. Saoirse Ronan is only nine days older than me (!!!) so she should wear something sweet and youthful. I adore this fifties-style baby blue Nina Ricci dress; with the right jewels it could be a spectacular Cinderella moment dress. 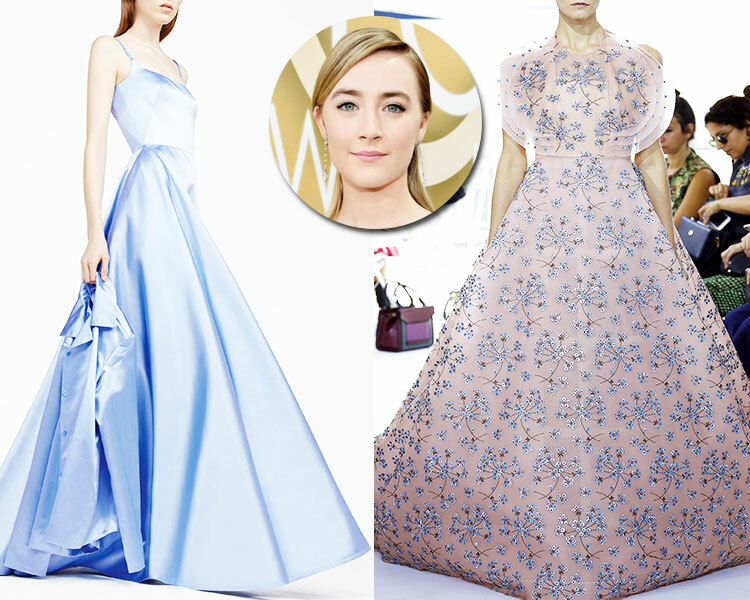 But I also think Ronan is the perfect girl to wear a Delpozo gown (seriously, more celebrities should be wearing Delpozo on the red carpet). I want Ronan to look like a 21st-century princess, and I can't wait to see what she wears. Lady Gaga is nominated for her work on the song "Til it Happens to You" from the documentary The Hunting Ground and I wasn't going to include her on my predictions list, but then I saw this Moschino dress and come on. Gaga HAS to wear this dress! It's a sophisticated version of her former days of fashion antics, and she would be WALKING AROUND WITH A CHANDELIER ATTACHED TO HER HIPS. Make this happen, people. If not because it would be the most talked-about red carpet look since Bjork's swan dress, then to see how one can possibly sit down in this. 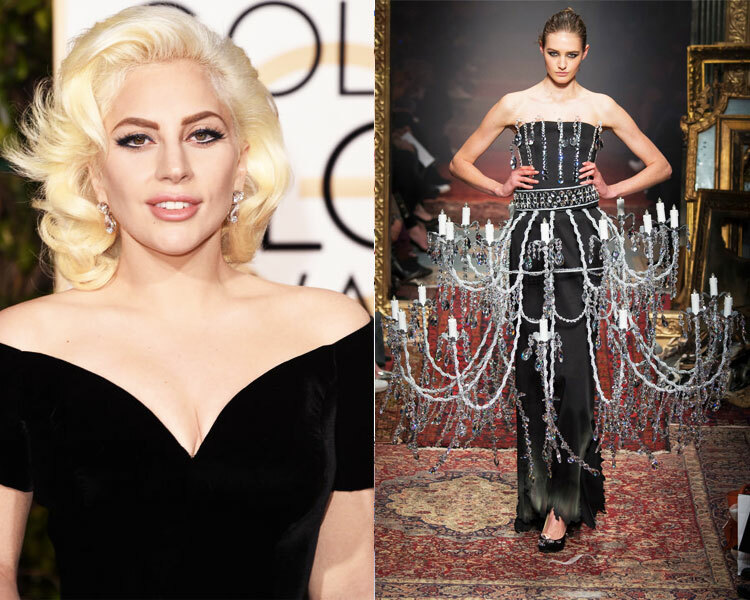 But yeah, #ChandelierDressForGaga2016. Get it trending. Which designer dresses do you want to see on the red carpet? Let me know your predictions! It should be a good show! Hopefully Leo wins, I think the internet will explode if he doesn't! Thanks for reading, Paulina! Loved this post. 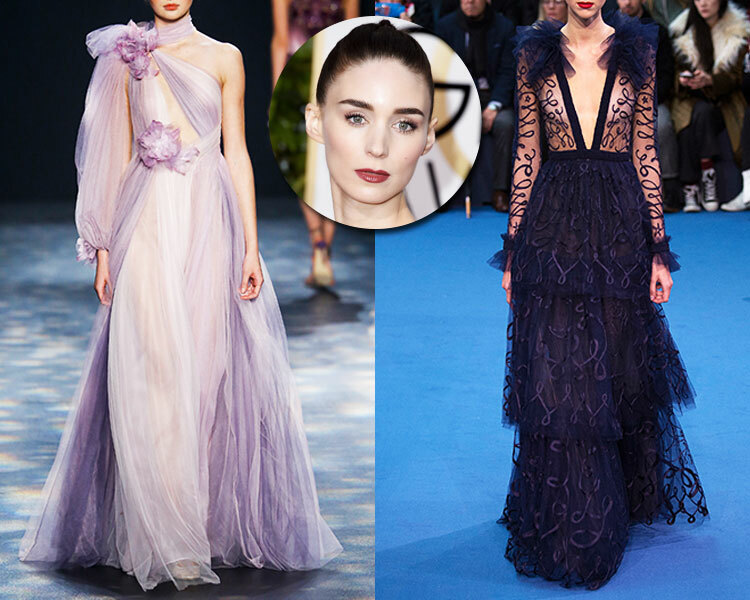 I wish Rooney would wear Marchesa but unfortunately she never has! She wears Givenchy and McQueen a lot, and only sticks with neutrals for the most part.